This year, Vine Street Baptist Church endeavored to create their own VBS material. We felt it was important to continue the story line that started last year — getting the participants that were in Egypt out of Egypt. We knew we could create the material and the shops (craft projects), but we were concerned about creating the music for it. Our concerns were quickly dispelled when VBS Director, Mickie Bainter, wrote some lyrics and passed them along to Minister of Praise and Worship, Dr. Johann Kim. Each time Dr. Kim was given a set of lyrics, he had music created by the next day. 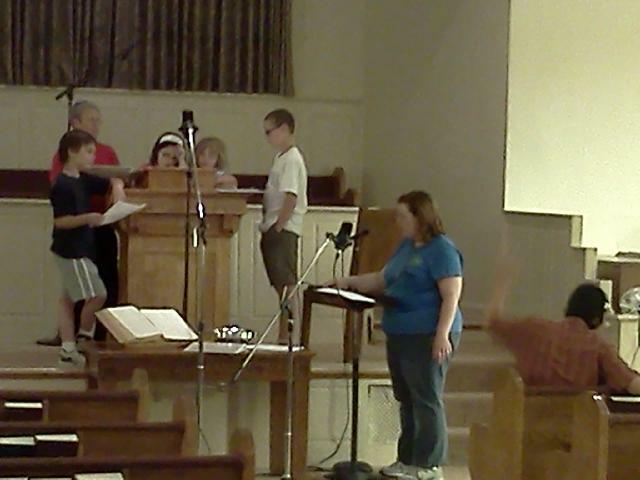 After several weeks of practice with some of the kids of Vine Street Baptist, we decided to record them singing the songs for playback during the VBS Gatherings. Here’s a picture of our recording session.